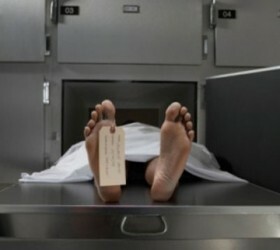 Two workers in a South African morgue received the shock of their lives when a ‘corpse’ woke up and demanded to be let out of ‘the cold place’, South African health spokesman Sizwe Kupelo has revealed. The 50-year-old man woke up in the middle of the mortuary, causing two terrified attendants to flee believing he was a ghost. The man’s family had called an undertaker believing him to be dead, but the man woke up and asked to be taken from the cold morgue, according to the Associated Press. The attendants, after fleeing the building, called for help and returned to find the man alive. The man – whose identity has been withheld -was then taken to hospital suffering from exposure after spending nearly 24 hours in the cold mortuary. How it could be possible. I don,t believe this. Weird stuff indeed, did nobody check for a pulse, stuff of nightmares waking up in a morgue. Pretty scarey stuff. They must have thought he was a zombie.